Owning a Songket is a proud legacy, not just kept to oneself but to be shared its history and beauty with others. Here are a few display ideas that could be helpful when figuring the best way to include Songket in homes and public places. Before displaying any textile collection, avoid display space with direct sunlight as this may cause color fade. The first option is to sew the Songket on a rigid mount— a larger fabric that is stretched over frame. This must be done by professionals to avoid the base fabric from sagging in due time. This method is highly recommended for old antique Songket as it may not withstand stretching. 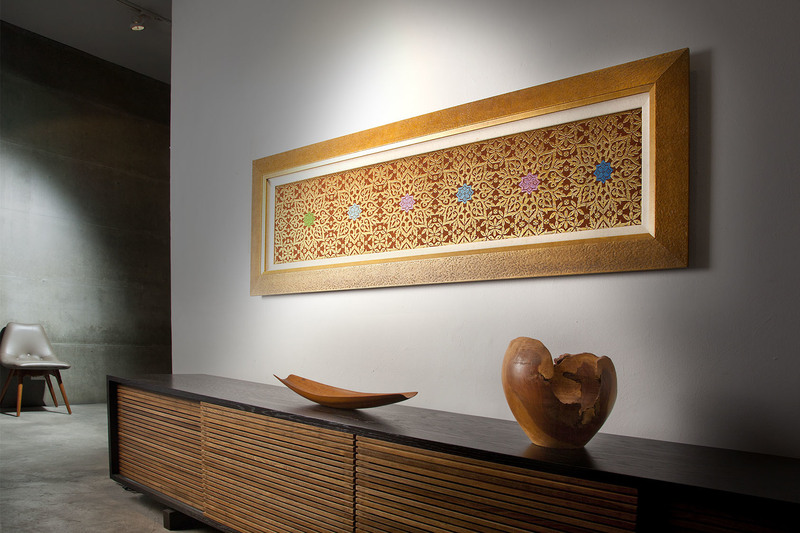 Songket could also be stretched directly on a solid board before putting in framed border. The board however should be padded before laminating the Songket. Nevertheless, this option is not recommended for antique Songket because the textile may not be strong enough and ended up ripping. After the Songket is properly mounted, it could be framed with or without glass. Due to its tactile quality, Songket is better protected under glass. Use non-reflective glass for better effect. Perspex is good for sarong size Songket as it is lighter and difficult to break. The simplest way to hang a Songket is by using rods or poles suspended from the ceiling or wall. While plastic rod is the best, avoid using unpadded metal or wooden rod. Long Songket shawls or runners are suitable in using this type of display where the bottom part of the textile often have beautiful long fringes or beaded tassels. Just make sure that the Songket can hold its own weight from the free hanging. Some other creative ideas include draping Songket over special clothing racks such as a kimono stand.